It is fifteen days after the horrible attack on America by the Terrorists. I have written much about that event and thought little of why I was writing it. Today, I have taken the time to realize I owe you the thanks for putting me at Ground Zero that fateful day, so I would remember in my heart and soul the faces of terror I witnessed , and forever lock in my mind the devastation terrorism brings to the innocent, the helpless. As my words march into the future, I ask you to guide them so they are as true as possible. Let them not seek fame and recognition, but rather impact and action by those who read them. Help me crumble my pride, and open my heart. 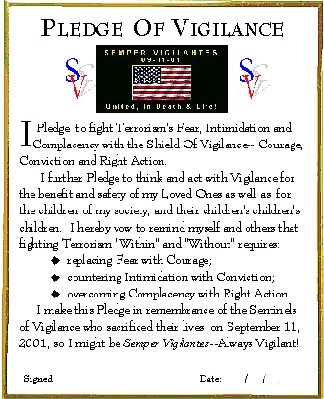 I ask that you help me withstand the pressures and obstacles I will face as I seek to promote the “Semper Vigilantes” theme across America and to the world. Daily, I will need strength to face my own terrorism. I will be questioned as to my authority to speak for the brave who died that day. I will be criticized for what I say and how I say it. I will be intimidated by the scholastic and religious and political who are more learned than I, for I have no labels behind my name to give me peer status to argue with those of grand reputation and renown. I have only my experience, my beliefs to guide me—and, hopefully, your support. I pray that you keep my children’s’ and grandchildren’s’ faces before me as I write so I remember it is to them I speak, not to my critiques or lofty peers. Let me aim my words at the children, and their children’s children eyes so I will keep the arrows of Vigilance focused on the bulls eye, and not be swayed to write words that will please the masses, that will make them comfortable. I pray that I will keep vigilant in my connection with you, my higher power, always knowing that ultimate justice will come to those who try to usurp your power of “good over evil,” and that no religious banner of any denomination from any faction can supercede your authority or responsibility to police justice. Let me be a servant of Vigilance, a warrior with a Sword and Pen, ready to fight to the death for the children’s rights to peace and freedom from terrors of the soul and terrors of the land. Help my words become a shield to protect the parents of the children from complacency and fear. And let me never forget the Beast Of Terror is always everywhere, and only through vigilance will we defend ourselves from its eagerness to consume us. I ask this of you, the Great Spirit of Justice, on this day, September 26, 2001. Go To: "The Great Ben And Jerry's Plot"